England's Serena Guthrie helped Jersey's Team Jets come back from a 25-17 half-time deficit to draw 43-43 with Telstars in Premier League Two. Guthrie came on for the second quarter and went on to play the entire match as Jersey stay second-from-bottom of the league, a point off four other sides. 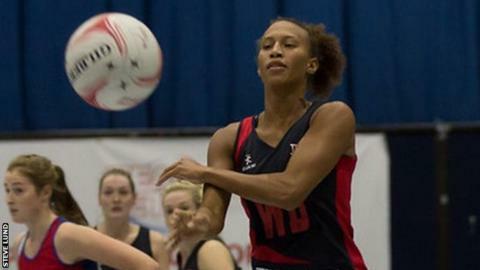 Jersey-born Guthrie helped England to World Cup bronze in August. "It was really good fun to get back out there, I've never officially played for the Jets," she told BBC Radio Jersey. "I think the girls are a bit disappointed, we had opportunities to win it, but some crucial errors throughout the game let us down," added Guthrie, who now plies her trade as a professional with the Auckland-based Northern Mystics. "But it's nice to get the draw when we went so far down at the beginning of the game." The island side had won just two of their seven previous games after winning promotion to the second tier of English netball via last season's play-offs. "It was a delight to have Serena on the court," said Jersey coach Linda Andrews. "We never give up and we've been down 10 or 12 goals before and pulled it back and we will fight to the end of every single game and that's what the girls did today."